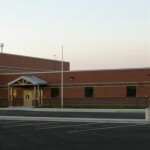 Due to a small school population and the need to conserve district resources, the Recluse School was custom designed to accommodate more than one grade level per classroom. 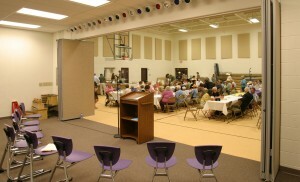 Other rooms serve multiple functions. 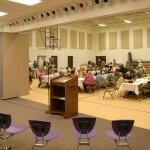 As is common in small communities, the school is a focus, and school events become community gatherings, often in the combined gymnasium/cafeteria/performance platform, an efficient design we have used in other venues. Because each classroom serves multiple grades, the rooms have double the normal amount of storage cabinetry and therefore wall space was a premium. This constraint, combined with the need to satisfy SFC requirements on daylighting and the school’s request for windows low enough for the students to see out, resulted in an unusual window layout that met all needs. The school is designed with a central core surrounded by a double-loaded corridor servicing the classrooms. This arrangement allowed for efficient emergency exiting that uses both the main entry to the school and the mudroom entry from the playground. Malone Belton Abel provided complete architectural, structural engineering, interior design and furniture selection services.